USB 2.0 vs USB 3.0: What's that Difference? 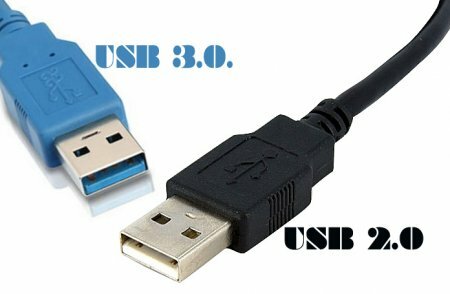 USB 2.0 vs USB 3.0: What’s that Difference? Now days, new computers have been coming with new upgrades and features. One of the best upgrade are the USB 3.0 ports. But why it is better than USB 2.0 ports? Should it provide you better speed performance and if yes, then how much? If you have all these questions in your mind, then you are a right place. Here you will find the difference between two USB versions 2.0 and 3.0. USB is the standard & defines maximum signaling speeds for communicating across the USB port. USB 2.0 standard offers the theoretical maximum signaling rate of 480-megabits/second, while USB 3.0 defines the maximum rate of 5-gigabits/second. In other words, the USB 3.0 is more than 10 times faster than the USB 2.0. If comparison ended here, upgrading would be no brainer. Who do not want their USB drives to be 10 times faster? Truly, this standard just defines maximum transmission rate of the data through the USB port. Device will have other bottlenecks. Example, USB drive will be limited by speed of its flash memory. If you are not sure whether you are having USB 3.0 ports, just look at USB ports themselves – USB 3.0 ports are always colored blue from inside. Some computers also have both USB 2.0 & USB 3.0 ports. In the photo below, the port on the right is USB 3.0 while the port on the left is USB 2.0. Charging power for both the USB ports – USB 2.0 and USB 3.0 are different. The charging power for USB 2.0 is 100 milliamps along with smart charging while the charging power for USB 2.0 is 900 milliamps which is without smart charging feature. USB 2.0 was first available in year 2001 and USB 3.0 was first available in 2009. Price is still the huge factor here. Most of the USB 2.0 flash drives are very cheap – such as, 8 GB USB 2.0 pen drive is available for $5 approx on Amazon and 16 GB pen drives for $8 approx. In the comparison, USB 2.0 drives are cheap and USB 3.0 drives are expensive. You have to ask yourself how much money you want to spend and what you will use the pen drive for. Do you only want small and cheap USB drive for moving documents occasionally? USB 2.0 is fit for that. While on the other hand, if you need a drive for frequent use as well as high speed, particularly if you are transferring huge files around, you will have to get a USB 3.0 drive. Keep in mind that several USB drives won’t work faster even if they are USB 3.0. If you are also using USB mouse & keyboard, then you won’t see any improvement in the speed.